Last week for JudiLynn India exhibit at Ce Soir Arts…don’t miss it! – Ce Soir Arts – Be inspired tonight! Last week for JudiLynn India exhibit at Ce Soir Arts…don’t miss it! We have been enjoying a beautiful exhibit – at both The Gallery and The Conservatory at Ce Soir Arts – by celebrated painter, designer, and gallerist JudiLynn India. She has brought a stunning collection of her original works to share this past month (June), and has graciously agreed for us to extend that through July 07. These works will capture your imagination and delight your senses. Bright colours, intriguing forms, and deft layering of texture draw the eye. Each piece imparts energy and spirit, and holds its own fascination for each viewer; your perspective is recognised by this artist and her work is created with that specifically in mind. JudiLynn‘s education and experience are rich with exploration and expression, as her art has been with her since her earliest memory. She is technically adept with acrylics and the digital stylus, but there is an element of spiritual inspiration that can be felt. You don’t want to miss immersing yourself in this captivating exhibit. 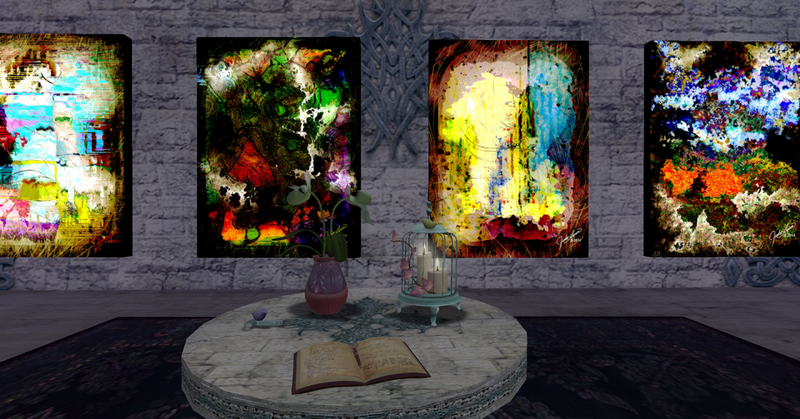 At The Gallery at Ce Soir Arts on the main level and at The Conservatory at Ce Soir Arts above the venue space, you are sure to find pieces that speak to you, and JudiLynn has set them for sale so that you can continue your admiration of your favourites at home. We’ve had a lovely time interacting with patrons who have not been shy about sharing their thoughts about this exhibit. Whilst the Guest Book is reflective of only a few of those comments, Aeon, Mimi and I have enjoyed several encounters with those who have come to enjoy. We prefer to allow our guests privacy at Ce Soir Arts, but when we are present and nearby, we often greet those who come to explore. It seems that those who come seek us out, sometimes – especially if they have a comment they would like to share (even if they end up not recording it in the Guest Book!). We are always amazed at what visitors have to say, and are generally charmed by both the comments and the commentators. Those sharing about JudiLynn‘s exhibit have been warm and positive – from the deeply thoughtful to the lightly delightful (and everything in-between). We thank each one…and we thank JudiLynn. Brava! Previous Another Lovely Hour with The Poet Laureate at Ce Soir Arts, Russell Eponym! See you at NOON SLT!